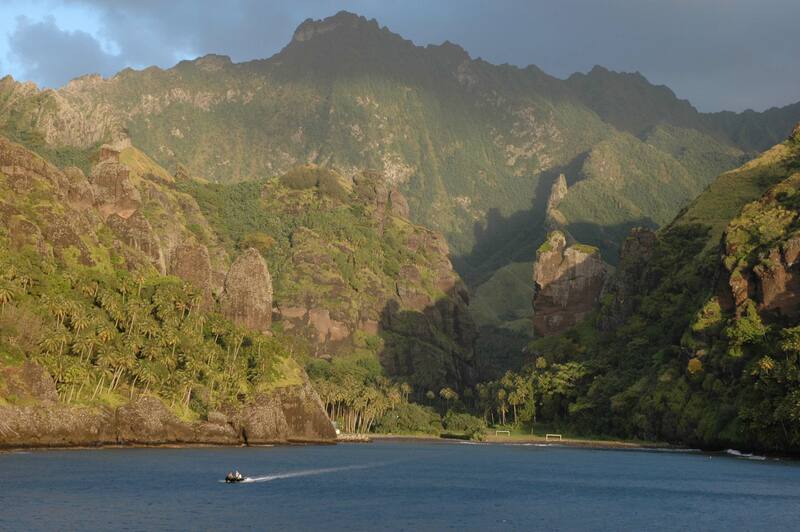 The Marquesas Islands in Polynesia are high islands with sharp peaks, towering spires and sheer cliffs. We recently completed an expedition through the Tuamotus and Marquesas and into the Line Islands. The guests traveling with us were amazed at the spectacular experiences awaiting them. Sailing from Tahiti, iconic island of the Pacific dream, we voyaged through the Tuamotu Islands, their coral motus (islands) and turquoise lagoons, remnants of ancient volcanoes scattered across the deep blue ocean. We met the local inhabitants who welcomed us with hip-swaying dances, experienced first-hand the way of life on islands governed by the rhythms of the sea, discovered the most idyllic beaches shaded by swaying palms, and dived into the clear waters to float above vibrant coral gardens, while divers experienced the exhilarating drift-dives for which the Tuamotus are famous. Sailing on, we reached the Marquesas Islands; politically part of French Polynesia, but very different from the other islands in this maritime nation. Geologically much younger, this archipelago of 10 islands formed as plumes of magma from the Earth’s core erupted from the sea floor and thrust volcanoes above the surface. These are high islands with sharp peaks, towering spires and sheer cliffs; impressive backdrops for the remarkable cultural and historical experiences they offer. Discovered by Polynesian voyagers about 1,500 years ago, we visited their ancient temples and ceremonial sites among the verdant forested interiors. Polynesian tradition was nearly wiped out by European missionaries who tried to “reform” their newfound colonies, destroying temples and banning dancing and tattooing. In recent years there has been a strong revival of these traditional arts, and we experienced the culture of the islands along with the modern-day challenges of life on these remote outposts. Our voyage continued north along the Line Islands of Kiribati (pronounced Kiri-bass). This string of islands is the most easterly extent of this island nation that straddles the broad expanses of Polynesia and Micronesia. Settled first by Micronesian voyagers, and later by the British, this former crown colony has been an independent republic since 1979. These are some of the most isolated islands on Earth, quite literally on the far side of the globe, straddling the equator and being the first points of land to see the dawn of each new day. With most of its territory just a few feet above sea level, Kiribati is preparing for the time when the entire nation is inundated by rising sea levels. We island-hopped between these far-flung eastern atolls, landed at both uninhabited and inhabited islands, met friendly people, discovered abundant wildlife, soaked up the sun on deserted beaches and experienced the laid-back lifestyle of the Pacific Islanders.